If, before the death of Bobby Sands in 1981, there was a name most likely to survive in the popular memory of ‘the Troubles’—to join the ranks of Kevin Barry and Seán South—it was ‘Big Joe’ McCann. There were a number of reasons. First, the local legend that flourished after he was gunned down on the streets of Belfast grew out of the reputation he achieved in life. McCann, who joined the Republican movement as a teenager in 1963, was known both for his physical bravado and for his quick intelligence. Stories circulated of his exploits during the set-piece Official IRA gun-battles during the Falls Road curfew in July 1970 and at Inglis’s bakery in the Markets district of south Belfast in August the following year. Staff captain of the 2nd Battalion of the Belfast Brigade and ‘on the run’, the 24-year-old McCann was reputedly the most wanted man in the North when he was killed by British Paratroopers on 15 April 1972. 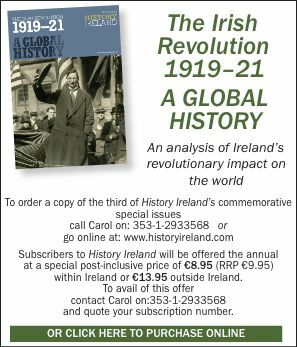 The tributes paid to him by his comrades at the time—‘a born leader’ according to The United Irishman—were to be expected. More revealing are the recollections, decades later, of two Dublin journalists of the deep impression that ‘Big Joe’ made upon each of them. Kevin Myers writes of his good looks, charisma, innate wisdom, gravitas and ‘curiously ironic and knowing sense of humour’. Pádraig Yeates remembers ‘an incredible character, the only genuine hero I ever met out of the Northern troubles’. Then there is the manner of his killing. As he ran away from a foot patrol after being fingered by a Special Branch officer, pursuing Paratroopers opened fire. Initial reports claimed that McCann was shot repeatedly while lying wounded on the pavement. 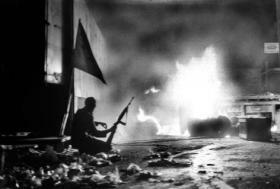 The shooting was followed by three days and nights of widespread rioting in which three British soldiers were killed—one in Belfast, two in Derry. Armed and uniformed Official IRA men patrolled the Turf Lodge housing estate. From prison the UVF leader, Gusty Spence, wrote a letter of condolence to McCann’s widow: ‘He was a soldier of the Republic and I a Volunteer of Ulster and we made no apology for what we are . . . Joe once did a good turn indirectly and I never forgot him for his humanity’. This poster, based on the picture, soon appeared. The full-scale military-style funeral was the largest seen in Belfast to that date. Led by a lone piper and McCann’s Irish wolfhound, over 200 women carried wreaths and over 2,000 men marched behind. Up to 20,000 people lined the route. Well-known politicians such as Paddy Devlin, Paddy O’Hanlon and Bernadette Devlin attended. Official IRA chief-of-staff Cathal Goulding delivered the graveside oration. The British prime minister, Edward Heath, wanted to know why arrests had not been made, while the secretary of state for Northern Ireland, William Whitelaw, conceded that killing McCann had made ‘a martyr of him’. Time magazine thought so too, and speculated that the shooting and the consequent street violence had scuppered all hope of Catholics accommodating themselves to the new direct rule, Stormont-less, regime. But there had been (and would be) numerous republicans shot by the security forces in controversial circumstances. Plenty of others have, like McCann, been commemorated in ballads. And since the 1790s large, stage-managed funerals-as-political-demonstrations have been a staple of republican mobilisation. The crucial reason for McCann’s posthumous local fame is a photograph (in fact two photographs shot in rapid succession by Ciaran Donnelly). In the early hours of 9 August 1971, British troops swept through nationalist areas of the North rounding up republican suspects for internment without trial, and touching off some of the worst violence of the Troubles. On 10 August a group of six Official IRA volunteers, led by McCann, took over Inglis’s Eliza Street bakery in the Official stronghold of the Markets, and in a fierce firefight pinned down a large contingent of British soldiers. During the exchange a photographer captured the profile of McCann in silhouette, hunkered down, an M1 carbine resting on his knee, a Starry Plough flag fluttering above him and a truck-barricade blazing before him. Front cover of September 1971’s The United Irishman. Note that it’s a different photograph, taken from a slightly different angle. 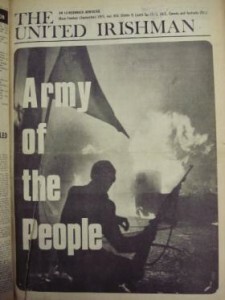 The September issue of The United Irishman displayed the picture on its front page, headlined ‘Army of the People’. The Provisionals’ An Phoblacht also ran it. Weeks after his death The United Irishman referred to ‘the now world-famous picture of Joe McCann’, which ‘far more than words epitomised the courage of the man’. 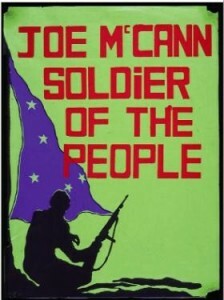 A poster based on the picture proclaimed ‘Joe McCann, Soldier of the People’. In his book Colours, from bombs to boom Henry McDonald compares a U2 album cover, Under A Blood Red Sky, to the McCann photograph. But while there are conspicuous similarities, there is no evidence that any member of the band was aware of them. McDonald himself had the silhouette skilfully stitched into the montage on the dust-jacket of his own book, and most recently the picture shows up unadorned on the front of Seán Swan’s Official Republicanism, 1962 to 1972. John Mulqueen is a postgraduate history student at Trinity College, Dublin; Jim Smyth is Professor of History at the University of Notre Dame.